There are many kinds of Japanese confectionary. In summer, we can have cool summer confectionaries in Japan. 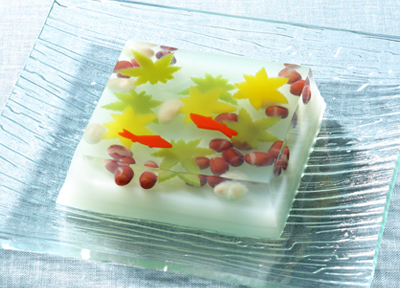 Today, we’d like to introduce you some Japanese summer confectionaries that is beautiful and enjoyable. The contrast of goldfish and maples is so tasteful. The part of the foundation is a yogurt flavored sweet bean jelly. It’s an appropriate taste for summer. Two red goldfish are swimming in a small space. This sweets uses a natural fragrance made in Versailles, France, and tastes of lemon. Enjoy the beautiful small world ! This is very summery confectionary ! Transparent lemons in an agar is fresh. It’s a little solid and tastes sour. So recommending ! This is a lovely confectionary chilled after boiling down sugar and agar. The vivid petals are inside a fresh agar. There is a sense of summer season in this confectionary. It’s a very graceful confectionary like a goldfish swimming in the glass bowl. It is too good to eat ! This is one of the hot product that comes out in summer. We can visualize a summer thundercloud from this confectionary. It’s like a wonderful photo put in an album. That’s the art ! Though it’s simple, it seems to be packed with a variety of feelings. Hamaduto is a summery jelly confectionary that jammed in the shell and make us feel the ocean. It’s less sweet, but the taste is strong. The brown object that we can see in the jelly is a Hamanatto. The moderate salty brings out the taste. What a romantic design it is ! Hoshidukuyoru is a confectionary that wonderful starry sky makes us feel a shining night sky. It’s a very refreshing taste which passion fruits and lemons are faintly fragrant. It’s recommended to chill, and you’ll feel more summery ! Did you feel cool to see these confectionary? It’s the taste of Japan to feel the summer. We also recommend you these ones as souvenirs. They would surely be pleased !